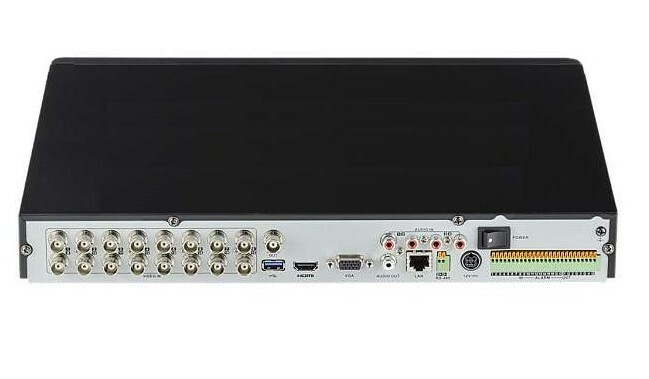 The H1604DVR-4K DVR takes video recording resolution to 8 megapixels for ultra clear images and improved identification. Backward compatibility means you can use your existing analog cameras as well as the new 8MP HD-TVI, AHD or CVI high definition cameras. The video recorder will automatically detect the type of camera making it easy to mix and match any combination of HD or analog cameras. HD-TVI 8MP cameras provide 4X greater detail and clarity when compared with standard 1080p HD cameras for better identification at longer distances. Setting up and using the DVR is quick and easy with the setup wizard and user friendly menu. Recording options include continuous, schedule, alarm and motion with Smart Search to find motion within a defined area. Image adjustments for each channel such as brightness, hue, contrast and sharpness are available along with arranging camera text overlays such as camera name and time and date stamp. Smart phones and other mobile devices are also supported allowing for live viewing, playback, recording and limited configuration using the Hik-connect app. Full configuration along with live viewing, recording and playback are also available locally or over the Internet by computer using Internet Explorer or the CMS (Central Management Software). View and configure up to 64 cameras from multiple device locations with our CMS software. Searching and playback can be done by time and date, all day, alarm, motion or smart playback. Backup is easy using a USB flash drive or USB hard drive. The H1604DVR-4K also supports Cloud Storage so your motion event images can be safely backed up to services such as Google Drive or Drop Box.